Are we at the point where single-payer ought to be a litmus test for any committed progressive? A few years ago this was a point of contention, but it doesn’t seem to be anymore. Whether it’s because of Bernie Sanders, or the failed Trump plan, or just a steady move to the left among liberals, true single-payer now seems to be back on the liberal agenda. Thus we’ve come full circle. Harry Truman supported single-payer; LBJ implemented it for the old and the poor; and Nixon almost agreed to it in the early 70s. Then liberals gave up on it as a bridge too far, and we got Clintoncare and the Obamacare. But now it’s back. 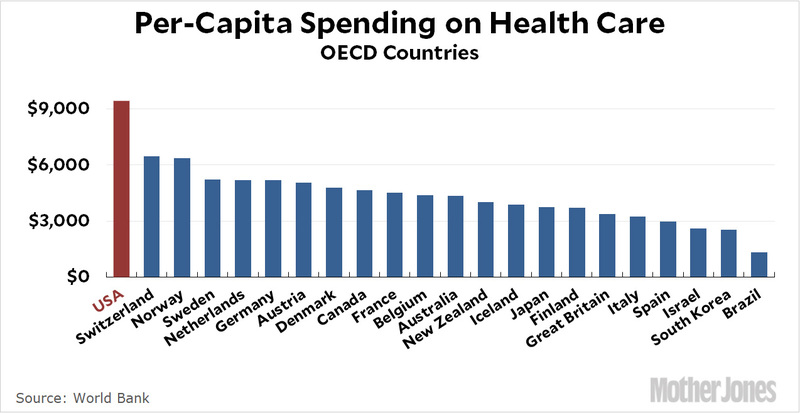 Is it really single-payer we care about, or universal health care any way we can get it? This is an odd part of the conversation. Everyone agrees we want universal coverage, and in practice the only options open to us are single-payer and multi-payer. (See here for an explainer.) There’s virtually no real difference between the two, and I’ve always assumed that lefties have adopted the single-payer mantra mostly out of convenience. But maybe not. Multi-payer usually refers to the government plus some assortment of sickness funds, employers, and private insurance plans that are so heavily regulated they’re almost like utilities. Perhaps there’s really a difference between those of us who don’t care much about the plumbing and those of us who hate private coverage so much that only pure single-payer will do. I’m not sure. Should health care wonks get into the action by creating genuinely workable plans for transitioning to single-payer? This is what Yglesias talks about today. In a way, it’s almost a caricature of liberalism, insisting on full-blown white papers for lefty plans while our current conservative president basically won office by promising better, cheaper, more comprehensive health care that will cost the taxpayers nothing. “It’ll be so easy,” he assured us over and over. Why aren’t liberals allowed to do that? Speaking for myself—and who else would I be speaking for?—I’d say the answers to these three questions are yes, universal, and yes. With Obamacare in place, single-payer really ought to be something that liberals coalesce around. However, I don’t happen to hate private options so much that I’d dismiss them out of hand. A good multi-payer plan is fine with me. And yes, this probably is a good time for wonks to start putting some meat on the single-payer bones. It’s worth hashing out some of the problems now while nobody is paying much attention. That doesn’t mean our next presidential candidate has to run on a thousand-page plan, only that our next candidate should have a good idea of which obvious pitfalls to avoid. If Republicans had been serious about this over the past seven years, they might have succeeded in repealing Obamacare. They failed largely because they settled for crowd-pleasing slogans and were blindsided when it turned out that simple-minded legislation wasn’t as popular as simple-minded red meat for the base. Liberals would be wise to avoid the same mistake.